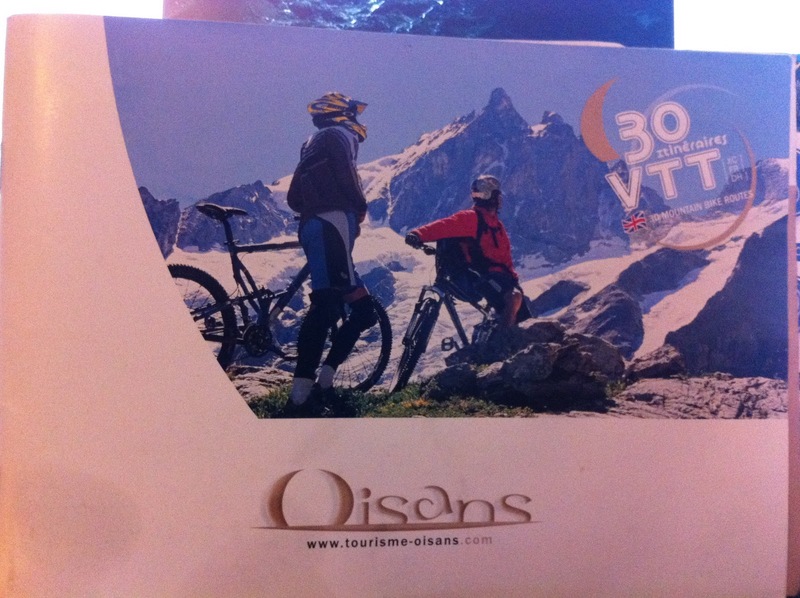 This year we headed South to the Oisans Valley for a 2 week cycling holiday. We wanted to tackle some of the big passes within the area as well as survive the most famous of all Alpe D'Huez. After a little internet surfing we found a campsite just outside Bourg de Oisans at the foot of Alpe D'Huez called A La Rencontre Du Soleil. The pitches were plenty big enough with hedges either side that gave excellent privacy. As K's parents were joining us a few days later this did not really matter. On arrival at the campsite it was soon obvious that this was the place to be if you love cycling! As the Tour de France had past through 2 weeks earlier it was still buzzing. The journey only took just over 10 hours from Calais and was a very pleasant drive. We arrived mid afternoon and decided to gain as much information as possible about the area and the best riding within the area. We were amazed that we could get a guide book for road routes and mountain bike routes from the tourist information for free. The books were excellent quality and had 30 rides in each with maps and key information. The first ride was going to be a nice warm up to get over the journey and get used to the different demands on the bike. With a Route de Grande Alps and a Pyranean coast to coast in the bag we had some experience to rely on. We modified the route slightly and rode down the valley turning right to Allemont. It was soon obvious that this area looked after cyclists with designated lanes and signs everywhere! The first climb of the route was up the barrage to Lac du Verney. The gradient was very moderate and it soon over to reveal a great view. It was soon time to turn right and head to Villard Reculas. The climb had great views and was just enough to stretch the legs. At the top we stopped at the local cafe for a coke and to admire the view. We decided to ride over to the village of Huez and then turn left and finish on Alpe D'Huez. The road around to Huez was stunning, traversing the cliff face! The view across the Oisans valley was amazing. We joined the famous climb at bend 6. We had a time that we wanted to beat on the climb so having some knowledge from Huez onwards was going to help!! At the top we decided to take a look in the numerous shops before heading back to the campsite which lay at the foot of the climb. Overall about 30km of riding and a great start to the holiday. Like children in a sweet shop we were keen to do every ride in each book even though we knew it was not possible!! We were heading for the cable car at Venosc that would take us to Les Deux Alpes and from there we planned to take the Jaundri express to the Glacier de la Girose and pick our way down the numerous mountain bike routes on the mountain. Having ridden a small pass to get to Venosc we decided on arriving in Les Deux Alpes to have dinner. unfortunately we had to wrap half of our lunch up and cart it around the MTB trails as it was huge! It made a great addition to tea in the evening! The Jaundri Express was an interesting ride to the Glacier, crossing big drops and steep terrain. The book does explain that the trails look worse from the cable car from Venosc than they were but we were not taking anything for granted! This was the Alps and they deserve the respect they command!! We took the blue off to break ourselves in gently. The place was littered with big down hill bikes and helmets to match. We looked a little out of place to say the least! There was good signposting all the way down through the ski resort and a lot of work had obviously gone into making this a place that can be enjoyed just as much in the summer! Reaching the mid station the terrain changed from scree to mud and grassy singletrack. The route we took allowed us to jump onto a more technical and very steep red route that would take us back to Les Deux Alpes. Riding through the car park at Les deux Alpes reveals the last section down to Venosc. It looks like a knife edge trail from the air but on discovery it was a fun rollercoaster of berms and fast flowing track! At the bottom we were grinning from ear to ear! Having had a great day on the bike we rode the 15km back to the campsite as our parents had arrived. 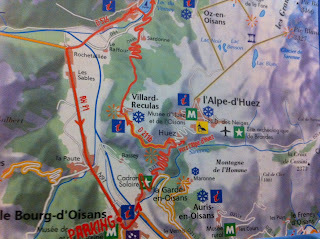 As an introduction to alpine cycling it was decided that we would do the Col d'Ornon for when Jim arrived from the UK. The ride headed down the valley towards Grenoble and then headed left up the Col itself. The maximum gradient was 10% and the distance was only 28km. The pass wound its way around a valley with steep sided cliffs. The view although not changing alot was still spectacular. The top of the col had a few restaurants where we decided to stop for a coke and chill before heading back down to the campsite. As we turned around we were greeted with a spectacular view with mysterious mountains in the distance. The descent was good fun and felt fairly short in comparison to the bigger passes. Back on the main valley road we headed through Bourg d' Oisans on the cylceway to show Jim the town that was going to be home for the next few weeks. Not satisfied with the ride K decided to try and beat her target time of 66 mins up Alpe D Huez. Armed with her IPOD she set off reaching the top in 69 minutes. Although not entirely happy she allowed herself to live with it, at least until next year! The next ride was going to involve a bit of travelling first. We drove over the Col du Glandon parking at St Jean de Maurienne where would start the ride. It was possible to ride from Bourg d Oisans but thats a big undertaking and one we did not feel would enable us to ride for the rest of the week! We could also have ridden up to the Col du Lautaret but we wanted to do the Col du Telegraphe. The ride up the valley was on the busy main road but the cycleway was once again great. There was little wind and the weather was stunning. The plan was to have lunch at Valloire before tackling the Galibier. The Telegraphe was a lovely ride with very little in terms of steepness and relatively short. The view down towards Modane was stunning. It wasn't long before we were approaching the summit. It was great to ride it after the Tour as the road conditions were great and the art on the road made a welcome distraction at times. At the summit it was time for a quick pic before dropping down to Valloire and food. A quick pasta re-fuel and it was time to tackle the Galibier. A favourite of K who has fond memories of it when completing the Route de Grande Alps. However we were also made aware of how long and tough this could be! Leaving Valloire the road kicks up to give a taste of things to come. As with all famous routes we were not alone and met some great people en route. The ride soon levels in the valley before you can see the road on the opposite side kicking up steeply. The next section was not too bad rounding another valley and the first glimpse of the summit which looks miles away both in distance and height!! It was so important to keep eating on the bike, you can feel a nutri grain disappearing in minutes! Turning left before the tunnel and off the main road takes you on the final section to the summit. It is a steep kick as if to remind you that you were not done yet! Throughout the holiday we kept wondering how anyone can race up these passes! This was to be our trade mark summit pose and it was not long before the friendly Spanish we had met that day began to follow in the tradition. This felt like one of life's moments! Time however was running on and we still had to descend and get back over the Telegraphe and down the valley. The descent was great fun, allowing us to enjoy the scenery once again. We reached St Jean de Maurienne just as we lost the light. We were quite tired by now highlighted by H's inability to unclip at the traffic lights in town resulting in fits of laughter and a grumpy French driver not seeing the funny side! 61 miles, 2 famous cols and a day to remember! Awesome! To appease Angela who was patiently allowing us to ride all the time we went down the valley to Briancon. Again fond memories for K who had stayed there on the Route a few years ago. The town was busy and very hot. The view from the top was stunning although the weather was building down the valley as predicted. After a touristy walk around and ice cream it was time to head back and plan the next route. It was time for H and Jim to tackle the 21 bends that lead to the top of Alpe D' Huez. All starting together there was a good steady pace going from the campsite. The only issue with camping right at the bottom is it does not allow for the best warm up! The first 2 km or so to the chirch at La Garde du Oisans is one of the hardest sections being the steepest. Apart from the kick at the end the rest of the ride is at a nice gradient. Soon H was finding her own pace leaving Jim and making K go back and forth between. soon approaching Huez the mood changes to a feeling of not long before the top! This is soon short lived as it starts to hurt more from this point on ! You can only imagine what it must feel like to be Lance in the tour storming to the top! The last ramp up to the sign that says arrive is hard and tests the mind aswell as the body. The village was busy each time we visited and had many cycling shops with great cycling kit in! As you go through the village you ride about another 2 km to the tour d france finish. Our plan was to follow another route from the book and ride over the Col d Sarenne back to Bourg d Oisans around the valley. Kwas in charge of the book and had not realised that the page she was reading was the wrong page! When telling Jim and H that it was all down hill after Alpe d Huez there were a few scowling looks when we started to climb the col d Sarenne! The other way is supposed to be tough and although a little weary from Alpe D' Huez it was an enjoyable experience all around! From the top the descent is fairly steep with spectacular scenery. It was not long before we met the main road back to Bourg d Oisans all content with yet another great ride in the alps. The first day of rain came of the holiday so we decided to chill out in the campsite. Even in the bad weather we found plenty to keep us occupied playing the odd game of table tennis in between the showers! We welcomed the rest as the next day was going to see us tackle two big cols. When driving over to climb the telegraphe we experienced the col du Glandon from the car! We vowed to come back and ride it. 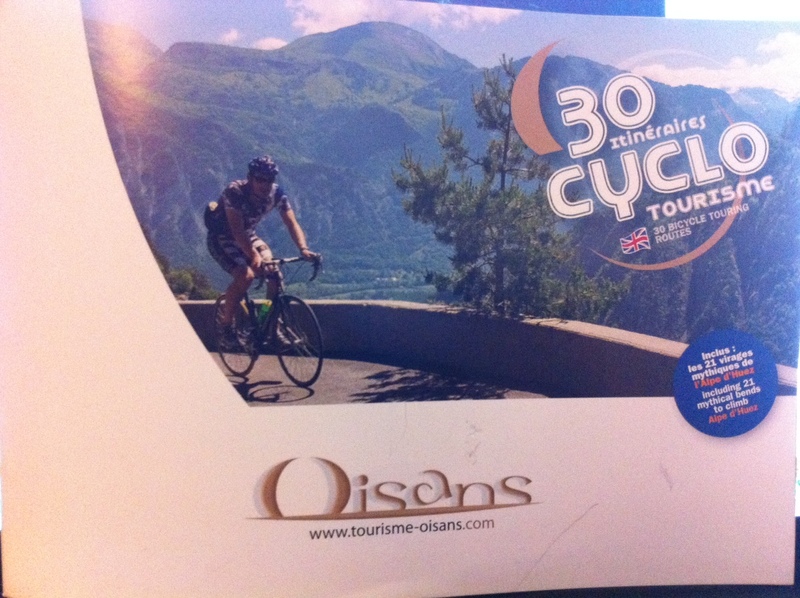 The ride in all was 51 miles starting from the campsite in Bourg d oisans and climbing the Glandon and the Croix. First we headed into town for an early croissant before heading off towards Allemont. We were becoming to know this road rather well this week. After Allemont we took the main road for a few Km before starting to climb the start of what would feel a very long climb! At least with all the effort you get two cols for the price of one. The Glandon would be first before descending a very small amount to climb to the top of the Croix. As Ab Fab fans we turned the col into a bit of a fashion statement with many 'le croix babies' being called! The climb is fairly relentless all the way apart from a few descents thrown in for good measure! The scenery changes once the dam is reached and it becomes much more alpine and exposed. The road also forms part of a spectacular view winding its way up the mountain. After a good couple of hours grinding on the pedals we reached the Glandon. A quick picture with the trade mark pose and we were off again to finish what we started! The climb can be seen all the way from the Glandon and it does not take long before you are heading over the top of the Croix. We decided to take advantage of the refuge at the top and ordered some lunch and a welcomed hot chocolate. The temperature at the top was low and combined with the wind it would be a nippy descent. Hitting a little bit of a climb on the way back was a welcomed relief. It was not long before we were back in Allemont riding back to Bourg d Oisans. We had certainly earned out BBQ tonight! A great ride with great scenery! We decided to get the thicker tyres out and check out the 84 switchbacks at Oulles! The climb was up the pass about 1000m of climbing in the hot sun which was great training. The route takes you to the village of Oulles before heading for the pylon before dropping through the forest to the bottom. The ride across the ridge to the pylon was quite intimidating. The mountain just fell away towards the Col d Ornon and the road we had just climbed. We had a quick bar on the bench near the pylon before putting the seats down and attempting the switchbacks. The first 10 we walked before getting the confidence to just go for it! The ride was thrilling from top to bottom! Some of the best natural singletrack we had ever ridden. At the bottom we had massive grins that told the story of the descent! There was time to take an evening snapshot of where we had come from before cylcing leisurely back to the campsite. Awesome! After a thrilling day at Les deux alp and Venosc we decided to show Jim what he missed before he arrived. We took the cable car to Les Deux Alp and then the Jaundri express to the glacier. The view at the top was just as spectacular with great weather holding for the week. Off the top we rode a mix of the blue and reds off the top. Its great how they are utilising the ski resorts in the summer to attract tourists. This was certainly a fun way to spend the day riding the cable cars to test your skills on different terrain. We were all awaiting the trail from Les Deux Alp to Venosc which was a great ride the last time we rode it with steep switchbacks and a mixture of roots and north shore. The last section is like one big rollercoaster down to the station. Another great ride on the mountain. The last ride of the trip was always going to be a special one. Having ridden the Col d' isoard on the route de grande alps I knew we were in for a treat. We drove to Briancon and got an early start. The climb was gradual with great scenery all the way. It has a little of a mediterranean feel. The weather was certainly making us feel like this. The last part of the climb goes into a tree lined road before popping out into what feels like a desert. The summit was busy with many cyclists and tourists combining to make a packed summit and a fight to get a photo with the monument. As it was the last ride we decided to treat ourselves to a nice lunch at the refuge just below the summit. It was a sun trap with a great menu and good service. The descent was great and varied. Briancon gets very busy in the summer so an early start is advisable. It was soon time to head back to the campsite for the last night of a great holiday! We will certainly be back. I have been viewing your blog and photos and am very impressed indeed. You obviously have a passion for the sport and a great manner about publishing your work. My father has been running a ski tour operating business, Ski Peak since the 1990's in Vaujany. We have also been operating in the summer but advertising more to the family adventure holiday market. I have joined the team this year and have seen how cycling is a huge sport in and around the Alps which draws people from all over Europe. I have been creating a new website based on cycling trying to advertise our accommodation and other sports. However I have hit a slight snag in the fact that I do not cycle and do not have any quality photographs of people cycling on the various routes which can be found around our area. I was hoping to ask your permission to use some of your original photographs for our website. We would be happy for you to use our accommodation in return or if you prefer a contribution to your costs.